This tour is a wonderful overview of Tulum – take in the ancient ruins, the beaches, the pueblo, local spots and some of the tastiest street food Mexico has to offer. 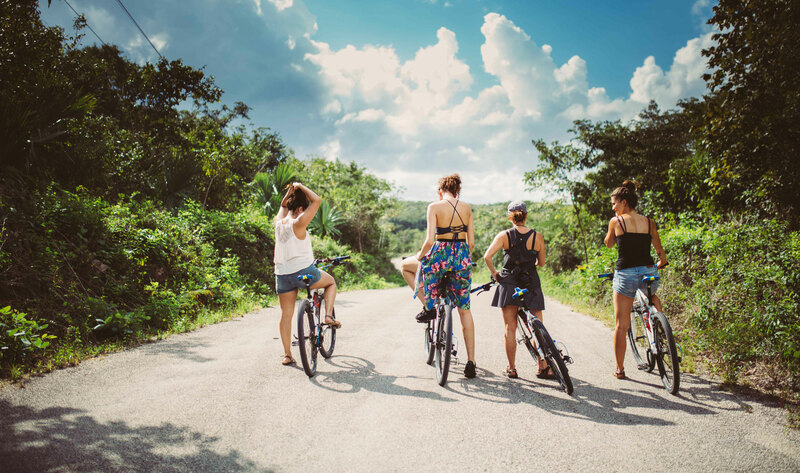 We take you through quiet roads and jungle paths, along the Caribbean shore and the streets of town; having a look at art, culture, ancient temples, local gastronomy and the traditions of the modern Maya. The only way to see a little bit of everything in this exceptional town; our bike tour is full of beautiful landscapes, lots of info on the area, interesting and unique places off the beaten path, delicious tacos, local honey and loads of fun. Both shared (min 4 people) and private expeditions run every day. Please indicate your preferred language when inquiring. Note: private expedition price per person decreases for larger groups.